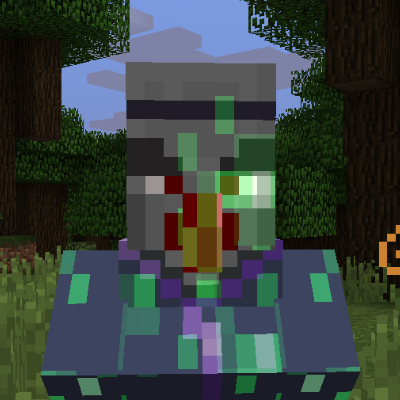 This is a little mod revolving around a mob called the Summoner. You might recognize him as an Illager and his name probably gives away what he does. There is more to him than you think however. Continue below for more info. This mod is still in beta! More features are planned and I expect a bunch of issues to arise mostly concerning mod compatibility and balance. It also requires MultiMob to run! These guys spawn like any other mob but are a bit more uncommon. They attack players, villagers and iron golems on sight. As you might have guessed they spawn a group of mobs to fight for them! Here you see a Summoner summoning some zombies to attack an Iron Golem. See the green around the Summoner? This means he is invulnerable to attacks! He puts up that shield when casting summons and it lasts a few seconds before it ends. He will keep spawning new summons on a cooldown; however the summons only stay alive for 500 ticks before they automatically die. If you manage to kill a Summoner; their summons will remain until their time limit is up. The Summons do not drop anything; however the Summoner drops a Summoner Orb and possibly some Emeralds. Summoner drop these 100%. They can be used to capture spirits of any mob! (Mobs can be blacklisted in the config file). While you have one in your inventory there is a small chance a spirit of a mob you kill is captured in the orb. The chance is dependent on the mob's health. A mob with 20 health will have a 1/20 chance of being captured on death. In creative mode, you can simply right-click a mob with an orb to capture them. Once captured; you can right click with the orb to summon the mob as your follower. This zombie is the follower of the player you see here. They follow you and attack whatever you attack. Shift-rightclick them to make them stay if needed. You will notice that spawning the mob costs durability for the orb. An orb has limited uses but can be repaired with an ender pearl. You can right-click the mob with the orb to make them retreat. The mob will also retreat when they die OR when their time limit runs out. A mob summoned from these orbs will remain for 2000 ticks (they also don't despawn). Not happy with the mob you captured? Simply put the orb in a crafting grid and you can reset it's contents. Time to make an army! Right-clicking a Summoner with an Eye of Ender start a mini-boss fight that can actually be pretty tough. The Summoner Boss has 5 waves of enemies that he throws at you; during that time he is invulnerable to any attack! Defeat the waves to make him vulnerable again. Be careful though, the boss can despawn when you die! So make sure you are prepared or you might not get a second chance. It's a decent challenge with a fun reward. The Boss drops an Enhanced Summoner Orb, as well as multiple Emeralds and normal Summoner Orbs. He also has a chance to drop a Totem of Undying. Works the exact same as a normal orb; however it has increased durability and any summon done with the orb has no time limit; basically making it a permanent pet until the mob dies in battle. The mod's config can be accessed from within the game through the mod options menu. - Edit Mode: Enable/Disable edit mode, see below. - Mob blacklist: A list of all mobs that cannot be captured by a Summon Orb. - Overlay: Enable/Disable the visual overlay for summons. CLIENT SIDE only. The Summoner spawn rates can be changed through the MultiMob settings. Edit mode allows you to edit the Summoner's summon groups and boss waves. See below how! This should be done server side only (or on both sides). Using the following method you can add modded mobs to the summoner groups. Whenever you capture a mob in creative mode using a Summoner Orb in Edit Mode; the game will put out a small file in the minecraftInstallationFolder/config/thesummoner/summongroups folder. That file is the NBT data for that mob (has no file extension). So you can use /summon to spawn a crazy mob, then capture it and create a nbt file for it. For boss waves; do the same as above but make a folder called "bossgroup1" for the first wave etc. Add all relevant NBT files to that folder to make them part of the wave. Seeing as these all go in order there is no need to define weights. Check here for some examples that the mod uses for it's default summon groups! Make sure you follow the syntax above as, although there is some safety code, some weird setups might crash the game. The game does output errors in the logs as well when problems occur. Why isn't this guy part of Primitive Mobs? - Mostly cause I felt the Summoner Orb feature was a bit too complex for a Vanilla-like feature, which is the primary focus of Primitive Mobs. Additionally the features of this mod still need quite a bit of polish; so I did not want to add it to Primitive Mobs as I think that mod is nearly out of beta. - An orb is not linked to a summon atm; meaning that when a summon dies they choose a random orb in the inventory. - When a player dies, a summon on a time limit can not return to it's orb so it will be lost. - The Summoner probably summons fires when running away atm. Will be fixed in next MultiMob version. - The ability to craft an orb together with a Sword to imbue it with a "Bane" towards that mob, meaning it will deal double damage to them. - Ability to heal summons. Please let me know if you encounter any issues in the bugtracker OR give some balance feedback if you find some stuff that's broken :) Thanks!! Could it be the summoner that occasionally gives a player unlimited buffs? We've had this happen a few times on our server when a player is battling the summoner. We had to cancel the players buffs with a command. Would you consider a Fabric 1.14 version? I'd love for these guys to be in village and pillage. will there add a summoned mob level up system? and a new Configurable function about level up mob turn into other mob ? Hey! Very good mod, thanks for your work! Can you please add a creative orb that doesn't break? This is a really great Idea. Im not that much of a fan that they can spawn like normal mobs. I prefer to find them in the mansion or other modded illager strongholds, or at least a config to reduce spawn rate. I came across at least 3 in groups. I got ripped to shreds that night. It was in early game too. This is it. It finally happened. For years, I have been looking through minecraft forums. Searching, waiting, pleading. But its finally happened. A mod that lets me become a Tamer of monsters. Vanilla, Modded, everything. My gratitude is beyond expression, but this is the pinnacle of modding. And its ONLY in beta? Its beautiful. Its gorgeous. And I think you for bringing this mod into existence. Can You Please Add Minion Skulls To Attack Players For example: Normal, Poisoned, fiery, Dying And Others. Sorry i got this problem when loading the mod can someone help me? It looks like you do not have the latest version of the Multi Mob mod :) that should fix it for you! I want something to carry many orbs like forcus pouch and wands. Carrying orbs take up my inventory. hey I forgot to tell you something in the last comment that happened with the original summoner which was more like a villager and not a illager plane to add it in the future with the skulls that he summoned and the friendly summoner that you will add soon will be defended by the zombies and other mob that attack the other villagers and the same? Not sure if the Summon skulls will return; they were a bit buggy but I guess cool enough. Maybe the friendly summoner could be a defender yeh. I don't think being able to ride any summon is a good idea; but if you capture a horse they are instantly tamed, so if you have a saddle you can ride those if you want to. hey you could add some form of cure to the souls of your pet mobs because for example the zombies hurt him the potions of instant healing you could add a way to cure them that does not depend on using the summon orb. Yeh I tried adding a healing item but Im not sure what would be balanced and making a new items just for Summon food feels a bit lame... still thinking of this one. Thanks! They still use their own attacks, so a creeper will explode. Sadly cause they use setDead to remove themselves during an explosion, they will not return to the orb, but thats specific to creepers :P but when capturing for example a dragon from ice and fire they will use fire breath attacks just fine. This is AWESOME. I know this kinda doesn't fit the scope of this mod, but could we possibly get pillagers or something similar in 1.12.2? Dang, I saw that you released a new mod and thought it was AtmosMobs (how's that going btw?). Looks super cool though.